Bumblebee lets you run accelerated OpenGL through your Nvidia Optimus secondary GPU on Ubuntu. 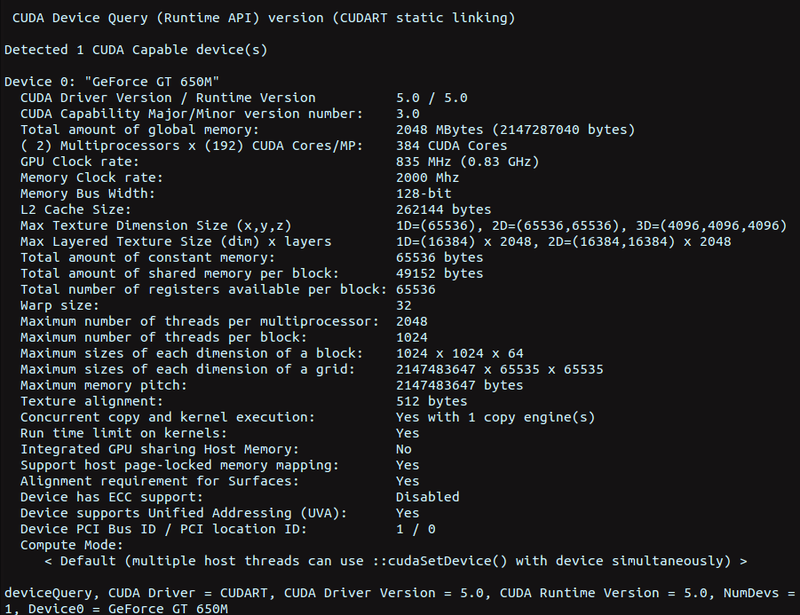 CUDA can be installed to run on that GPU without OpenGL or Bumblebee. There are guides out there for both of those individual situations. Many CUDA devs will also use OpenGL apps, and a proportion will also develop for both platforms. Guides to the concurrent installation of both are rare and seem to go stale fast. What follows is a simple script for the installation of both that worked for me at this moment in time with current packages for all the pieces and an up to date distro. YMMV, especially if some weeks have passed. Purge the default display driver. From what I have read, we need to be careful to install Nvidia drivers from the ubuntu-x-swat/x-updates PPA and not from inside the CUDA installer that we downloaded above. (The flag " -override compiler" is used to suppress an error message about the compiler being unsupported). Set the sample location where you want it, confirm, and wait for installation to finish. sudo chown -R yourusername:yourusername . Tadaa! You should see an image like the screenshot in this post. // #error — unsupported GNU version! gcc 4.7 and up are not supported! All of the compilation units for your projects will have to add the following two lines at the top of the file before any CUDA-related #includes. Ugh, The fixes for GCC 4.7.x compatibility above involve breaking atomics. What we need to do instead is install GCC/G++ 4.6 and tell CUDA to use them. You might need this flag every time you compile if you modify the install slightly from the steps above, but I didn’t need it. [55397.040507] [ERROR]Aborting because fallback start is disabled. Read more about nvidia-smi here. To avoid this issue, possibly flash support needs to be disabled in all web browsers. Chrome: Go to “chrome://plugins/”. Scroll down to the flash plugin and click “Disable”. Firefox: Go through menus: Tools->Add-ons, Tab Plugins. Scroll to Shockwave Flash and click “Disable”. I went ahead and disabled it like this without testing if the previous step worked first: no time. Feb 17 13:06:39 regent2 kernel: [51386.809566] NVRM: GPU at 0000:01:00.0 has fallen off the bus. Feb 17 13:06:39 regent2 kernel: [51386.809571] NVRM: os_pci_init_handle: invalid context! Feb 17 13:06:39 regent2 kernel: [51386.809572] NVRM: os_pci_init_handle: invalid context! Feb 17 13:06:39 regent2 kernel: [51386.809575] NVRM: GPU at 0000:01:00.0 has fallen off the bus. Feb 17 13:06:39 regent2 kernel: [51386.809577] NVRM: os_pci_init_handle: invalid context! Feb 17 13:06:39 regent2 kernel: [51386.809578] NVRM: os_pci_init_handle: invalid context!